Aletheia.org.uk | Who is Jesus? The matter of Jesus' identity is one of vital importance for all of us to think about. What Jesus did and claimed are both unique. You might imagine that Jesus, if he really existed at all, is merely a character from history, but Jesus is infinitely more than this. The following claim might seem staggering, but the truth is that the entire universe, every created thing that exists, was made by him and for him. Jesus is very much alive today. The apostle Paul wrote that he considered everything else in life to be worth nothing in comparison with, 'the surpassing worth of knowing Christ Jesus my Lord' (Philippians 3:8-9). Jesus is so important that whether we know him or not determines our eternal destiny. But truly knowing Jesus means more than merely claiming to know him. To truly know Jesus is to be known by him (Matthew 7:21-23). 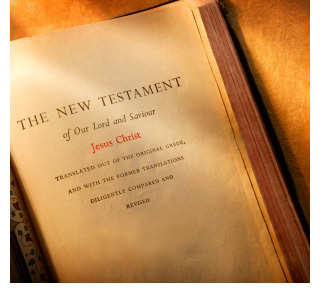 What else does the Bible tell us about the importance of Jesus? The supremacy and finality of God's revelation of himself to us in Jesus means that there cannot be and will not be any further revelation superceding, contradicting or adding to God's revelation of himself in Christ. This is the reason that Christians cannot and do not take seriously claims from various cults that their leader has received a new revelation from God that supercedes or modifies what Jesus himself taught, and what Jesus personally commissioned his original disciples to teach and to write down. Whether it be Joseph Smith, founder of the Mormons, or medieval mystics such as Julian of Norwich, the truth is that no-one can legitimately modify or add to the truth revealed in Jesus and taught by Jesus and contained in the closed canon of Scripture. Why take Jesus so seriously? As to why Christians take Jesus so seriously - it's because of who he is. Fully God, yet fully human too. He offended the religious authorities of the day by welcoming and loving the social outcasts that the self-righteous Pharisees wouldn't even dream of going anywhere near. He performed countless miracles in front of his opponents who did their best to deny what he was doing but could not. His opponents tried their hardest to find some charge to make against him but could find none. He was outspoken in always teaching the truth, and he warned about the judgment we would face if we do not change. (The change that God requires can be summed up as turning to Jesus in repentance and faith). Jesus both spoke about, and supremely demonstrated, the love of God. But, and this may surprise you, he clearly taught the reality of the wrath of God too; in fact Jesus warned of hell and God's punishment of those who continue in rebellion against him more times than any other person in the Bible. When Jesus said, 'Before Abraham was born, I AM,' (John 8:58), the expression he used for 'I AM' appears in the Greek (transliterated into English) as ego eimi. This is incredibly significant. It is necessary to know something about the Hebrew Scriptures in order to understand what Jesus was really saying. In his commentary on John's gospel, Don Carson has observed that the background to the use of ego eimi in this part of John is found in Isaiah chapters 40-55. In the original Hebrew of those chapters of Isaiah, God discloses himself as 'I am he', which in Hebrew (transliterated into English) is ni hu. The Septuagint (a Greek translation of the Hebrew Scriptures used by Jews at the time of Christ) consistently renders the Hebrew ni hu of Isaiah chapters 40-55 as the Greek ego eimi. Jews hearing a mere man make this claim would have heard them as declaring 'I am Yahweh', which means 'I am God', and a first century Jew would regard any mere man that claimed that name for himself as guilty of outrageous blasphemy. Most probably Jesus spoke the language Aramaic. He may have spoken Greek as well, and perhaps he also spoke in Hebrew at times. The gospel of John, like the rest of the New Testament, is written in Koine Greek. So we don't know which language Jesus used when he spoke the words 'Before Abraham was born, I AM,'. But John's gospel is a part of the word of God, written by an eyewitness disciple of Jesus (John 20:30-31, John 21:24), and so John's rendering in Greek of what Jesus said is an accurate rendering. The immediate reaction of Jesus' hearers to what he said in John 8:58 reveals that, whichever language Jesus spoke the words in, they understood exactly what Jesus was claiming - he was taking the name of God and applying it to himself. We know that they understood Jesus' claim that way, because John's gospel tells us that immediately Jesus said 'Before Abraham was born, I AM', 'they picked up stones to stone him'. Stoning was the mandatory death penalty for blasphemy. So Jesus had clearly claimed to be God, and his hearers knew this. The problem with the people who wanted to stone him was not that they hadn't understood what Jesus had just claimed, but rather that they failed to recognise who Jesus really is. Unlike any other man who has ever lived, Jesus had the right to take the ego eimi / ni hu expression of Isaiah chapters 40-55 and apply it to himself. To suggest that Jesus never claimed to be God is to fail to understand what Jesus said. But it's also true that just as with Jesus arrival Yahweh himself had come to his people, so the Father had sent his Son. Jesus revealed that the Father is God, that Jesus and the Father are one, that Jesus said and did nothing on his own but only what the Father gave him to say and do. He also promised to give the Holy Spirit, who is also God, to his disciples after his return to the Father. We are into the mystery of the Trinity here. Father, Son and Holy Spirit are three distinct (but not separate) persons, one in essence, one being, one God. Jesus is God, just as the Father is God and the Holy Spirit is God, and there is only one God. There is no room at all for saying that Jesus was merely a good man, or only a prophet, or a wise teacher. If what he said was true, he would have to be God. If you say that what he said was not true, then you have to also say that he was either deluded, or was lying. If you say that Jesus was deluded, or was lying, then you cannot still claim he was a prophet from God, or a good man, for no mere human prophet or genuinely good man would make the claims Jesus did if those claims were not true. And even if you write off everything Jesus said, you still have to reckon with what Jesus did - which were things only God could do. You would also have to account for the evidence for the resurrection of Jesus. Ultimately, Jesus died for the sins of his people in order to save them, and rose again. God raised Christ from the dead, thereby vindicating him as indeed the Son of God. In the death of Jesus Christ we see both the just wrath of God against sin and yet also the astonishing love and mercy of God that he would secure salvation for a vast number of people throughout history, and from every race and nationality, providing for their forgiveness and adoption as God's own children. God did this by bearing their sin, and the punishment they deserved, himself in the person of Jesus, God's Son. There is a response required of us though, if we want to receive this wonderful forgiveness - we must repent and put our faith in Christ. The Bible also tells us that God's raising of Christ from the dead is the testimony from God that Jesus is the one whom God has appointed as judge, and that Jesus will one day return to judge every person who has ever lived (Acts 17:31, Matthew 25:31-32, Revelation 20:11-15). Sometimes some Christian preachers give a message which suggests there are two alternative future destinations - heaven, or hell. This isn't quite correct. There are indeed only two mutually exclusive alternative futures for us - either we have come to Christ in repentance and faith, and our eternal destiny is with God and is wonderful - or we have rejected Christ and our eternity will be one of separation from God and punishment for our rebellion against him. But to describe these alternatives as 'heaven or hell' is misleading (as far as 'heaven' is concerned), as the Bible clearly teaches that God will one day create a new heavens and a new earth, and that all those who are God's children, all who are forgiven because they have put their trust in Jesus, will be welcomed into that new heavens and new earth (2 Peter 3:13, Revelation 21:1, Revelation 21:27). The idea of heaven as some kind of permanently disembodied and non-physical future state is an idea that comes from Greek philosophy and Gnostic ideas about the material universe being inherently evil. These ideas do not from the Bible. Gnosticism was (and is) a heresy which claimed (amongst other things) that Christ was never really a human being, because all physical matter is evil, and God would never become a real, flesh and blood human being for that very reason. This is totally wrong. Jesus is indeed fully God, yet the mystery is that when the eternal Son of God became a human being, he really did take on a real flesh and blood body. The material universe was created by God, who initially looked at the physical universe he had made and said that it was good. Yes our sin has spoiled it, but God's plan of rescue is to redeem all those who trust in him, and even to redeem the universe itself by creating a new heavens and earth that will never again be spoiled in any way (Romans 8:18-24). The Bible teaches that when a Christian dies, although their body dies, their spirit goes to be with the Lord (Philippians 1:21-26, also, in Hebrews 12:22-24 'the spirits of righteous men made perfect' is a description of believers in Jesus who have died, their spirits now being with him). We could call this heaven - but this is an intermediate state, and not our final destination. The Bible teaches that one day Jesus Christ will return, and believers who have died will return with him. They will then receive new resurrection bodies, as will those Christians who are alive when Christ returns. Jesus received a real resurrection body when he was raised (Luke 24:36-43), and his was the first resurrection of many, as the Bible teaches that all those who belong to Jesus will also one day receive resurrection bodies like his (1 Thessalonians 4:13-18, 1 Corinthians 15:51-57). So Scripture teaches that there will be a new heavens and a new earth, and believers in Jesus will receive new resurrection bodies, and not permanently exist in some kind of disembodied heaven. But the Bible also clearly teaches that hell is real, and that God will not ultimately allow rebellion against him to go unpunished (e.g. 2 Thessalonians 1:3-10). When Christ returns, it will not only be believers in him who will be resurrected. There will be another resurrection, of all those who lived and died in rebellion against him, and they will face his judgment Revelation 20:11-15. This is why it is vitally important for us to recognise who Jesus really is and put our trust in him. If we reject God's offer of salvation we will pay for our rebellion against God ourselves, which would be more terrible than we can imagine. This is not a popular doctrine in many parts of the church today, but there is no getting away from how it is clearly taught in the Bible - and most significantly taught by Jesus himself (Matthew 13:41-43, Matthew 13:49-50, Matthew 10:28). God warns us of hell because he wants us to turn to him and know his love and forgiveness while there is still time to do so. God loves us so much and does not want anyone to perish (John 3:16-18, 2 Peter 3:3-9, Ezekiel 33:11). Given who Jesus is and all that he did, the only appropriate response from us is to turn from sin and choose to trust him, and to surrender our lives to him as our Lord and our God (John 1:12, Romans 3:22-24, Acts 16:30-31, Acts 2:38). True repentance and faith in Christ involves a complete change of direction, and a Christian is someone whose whole life belongs to God (Romans 6:1-4, Galatians 2:20). But becoming a Christian begins with turning to Christ in repentance and faith (Acts 20:21). May God grant that you would do this.